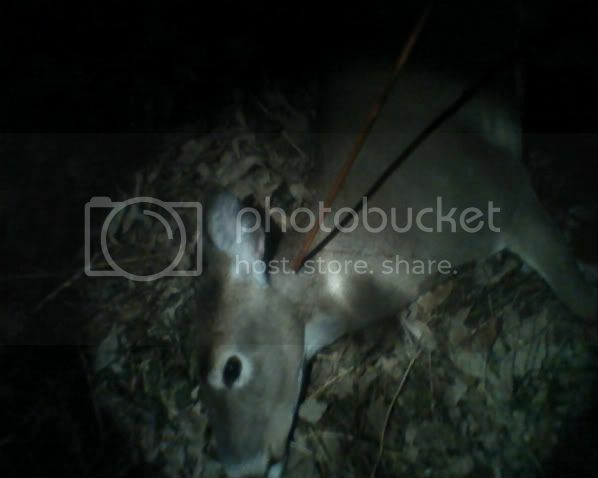 I got my first deer with my first longbow last friday evening. I saw her with two yearlings about 1/2 hour before sunset. They were crossing the creek behind me and about 50 yards to my right. I tried calling, but no luck. They moved up the hill in front of me and disappeared from view. Then, 15 minutes before the end of the hunting day, here they come, back down the hill and heading right down my path. The biggest one stopped 15 yards from my stand to my left. I stood up real slow and started to draw. As I'm drawing, one little one moves right in front of her, so now I have two deer standing broadside at 15 yards! It was getting kinda dark in the timber, but I anchored and released, and pow! I hit her in the neck just behind the head and dropped her in her tracks! The littler one took a few hops and stopped 10 yards ahead, still broadside! So I thought, "Okay..." and nocked another arrow and let her fly. I heard a good solid hit. 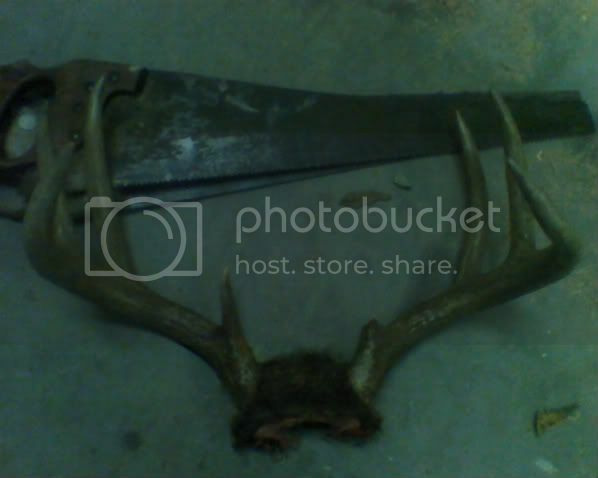 Great, two deer in the same day with my bow! Well, not so much. Found some blood, but couldn't find her. 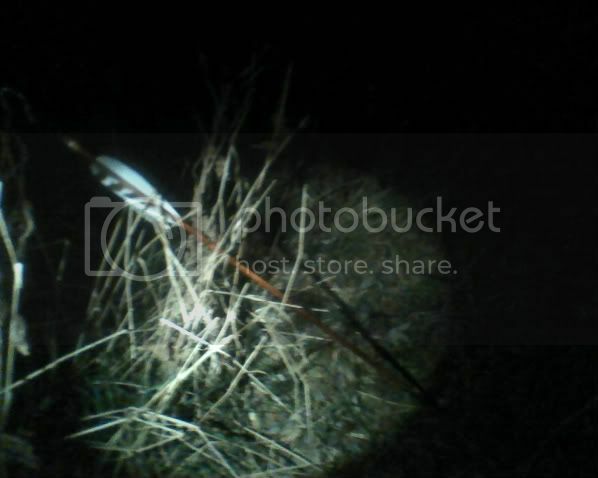 I tracked her the next morning and found my arrow without the broadhead. I'm guessing it hit her shoulder and bled just enough, but didn't kill her. Oh well, I got my first! k, so here's the pics. Here's my first kill. God was really directing the arrow on this one. she bled out inside and the broadhead spined her. She was dead in 5 minutes. Here's the start of the blood trail from the smaller doe. I really thought I'd find her. I'm pretty bummed that I couldn't. btw, please excuse the quality. I had to take these with my cell phone. while looking for the small doe the next morning, I came across this guy laying dead near the creek. Looks like someone gut shot him and lost the blood trail. He'd been dead a week or so. I know there's at least 3 more like him and bigger. They're my next targets. Congrats on your first! Sorry to hear you lost that second one, those doe are tasty treats! Spine shots happen sometimes, but next time, just pop over and slip another arrow in the boiler room straight away - better for the animal, that way. 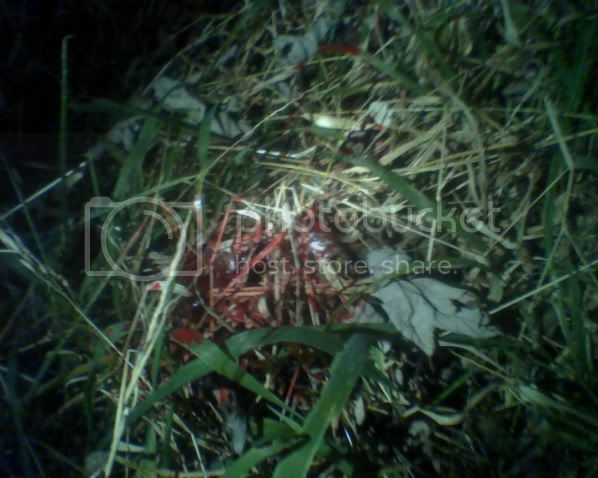 Out of interest, was the gut wound on that buck from a bullet or an arrow - or was it too far gone to tell? I'm pretty sure the gut wound is from an arrow. There's only one other younger guy hunting this land, and he thinks he hit an 8-pointer a week ago, but couldn't find it. I'm gonna see if he can describe the rack, and if he does, I'll give it to him. If not, there's a new addition to my wall\\!